These black satin slingback sandals are by Richard Tyler and were made in Italy. There are two black satin straps across the front with a design pattern of elevated dots and triangles. 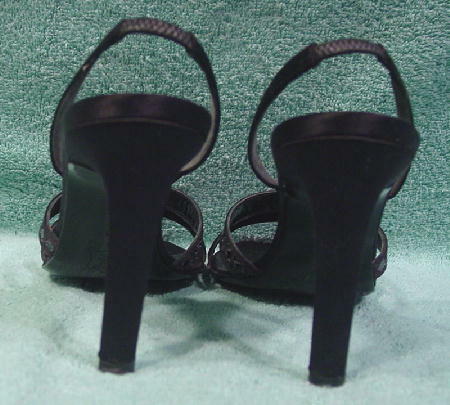 The toe beds, sides, and sling backs are black satin with a black elastic 1" strap in the center. The high heels have satin wrapped acround them and the soles are leather. The black leather insole has Richard Tyler etched in gold-tone letters. They're from a European actress. She wore them to an awards ceremony and afterparty.